The next thing I wrote was that since the visit fell on a Sunday, they were going to get to test “the Gutsy Cook choice of the week!”. See, I use every necessary trick in the book to get rid of the food around here. The menu for this week was Empanadas and White Bean Soup. Let’s start with the empanadas. The name comes from the verb empanar, meaning to wrap or coat in bread. Empanada is made by folding a dough or bread patty around the stuffing. The stuffing can consist of many things meats, vegetables, fish, the list is infinite. It is said that the dish originated in Spain and in Portugal and was carried to South America by colonists, where they remain very popular to this day. I grew up with empanadas. In Venezuela they are eaten for breakfast, snacks and there is no party without a plate full of empanadas. But, in most cases they can be eaten at any time of the day and is frequently served with Guasacaca and/or hot sauce. Unlike the Spain and Portugal version, where the dough is pastry based, made up of wheat flour and lard and usually baked, in Venezuela we use a corn flour based dough and fried them in oil or lard, but can be baked too, but the most popular way is fried. The stuffing varies according to region; most common are white salty cheese, shredded chicken or beef and ground beef. Other types use fish (shredded school shark or cazón, very popular, and my favorite stuffing), caraotas or black beans, Llanero white cheese, guiso (meat or chicken stew made with capers, red bell peppers, tomatoes, onions, garlic, olives, panela, red wine, and Worcestershire sauce). Oyster, clams, shrimps and other types of seafood are used as fillings in the coastal areas, especially in Margarita Island. Also, it can be made of fried ripe plantains (tajadas) and white cheese, which has a sweet flavour. An empanada filled with meat, black beans (Venezuelan-style), and fried ripe plantains (tajadas) is called empanada de pabellón, after our national dish, the pabellón criollo. When the empanada is cut open after deep frying, and doctored with added fillings, it is called empanada operada, a term which refers to a surgical intervention (operación in Spanish). In order to distinguish the types of empanadas in Venezuela, it is common to call Empanada Chilena the one that is made with a wheat flour based dough (or pastry) and baked, as Venezuelan empanadas are made with a corn flour based dough. The recipe in the Kitchen Bible takes after the Spain version and its baked and uses the pastry based dough. And let me tell you, the dough was the one that gave me a bit of trouble. Its pretty simple to do, but somehow I found it very crumbly and I guess I over compensated, since I added a bit more water that it called for and kneaded it more that I should have. The dough seem a bit heavy and I was worried. When it came time to roll it out, it was hard, I actually felt that I was in the middle of a workout. I even told Tom to close all the windows and to put the air back on, since I was totally breaking out and sweating. Thank god the filling was easy-peasy, it came together pretty fast. I followed the recipe pretty closely, except I added a bit of anchovy paste in order to give it a bit of a “omp” element. I also made sure it was pretty cold before I use it to fill the dough. Since these take only about 15 minutes of baking time and my guest were still a bit away, I placed them in the freezer to chill for a bit and about 10 minutes before they had to go into the oven, I brought them to room temperature. I got the golden crust at the 20 minute mark, took them out and let the stand for a bit. They are best eaten at luck-warm and not hot off the oven. We all love the stuffing, for all of us it was very unusual. Even me, that has eaten all types of imaginable stuffings, I never had them with tuna, so it was surprising how well it went together. And I’m going to make them again, but this time using the Venezuela corn flour based dough and fry them. I’m betting the crunchy texture will be a great combination for this stuffing. To make the pastry, sift the flour and salt into a large mixing bowl. Rub in the butter with your fingertips until it resembles fine bread crumbs. Beat 2 of the eggs with 2 tbsp water, add to the bowl, and stir until the dough holds together. Make a thick disk, cover with plastic wrap, and refrigerate for 30 minutes. Meanwhile, heat the oil in a frying pan over medium heat. Cook the onion, stirring often, for about 5 minutes, or until translucent. Add the tomatoes and tomato and anchovi (if using) paste, and simmer, stirring often, about 10 minutes, until thick. Remove from the heat and stir in the tuna and parsley. Season with salt and pepper. Preheat the oven to 375°F (190°C). Roll out the dough to a thickness of 1/16 in (2mm). Cut out 24 rounds with a 3½ in (9cm) round cookie cutter. Fill each with a spoonful of the filling. Brush the edges with water, fold over, and press the edges closed with a fork. Tip: I covered my dough with plastic wrap while rolling it, which make it easier and there was not need to use flour to keep the dough from sticking to the rolling pin or the surfaces. I also covered the folded empanada with the wrap when I was pressing it close with the fork. Place the empanadas on an oiled baking sheet and brush with the remaining egg. Bake for about 15 minutes, or until golden. Serve warm. Variation: Experiment with other fillings: replace the tuna with chopped cooked chicken or chorizo, or with diced cooked potato, picadillo or let the imagination run wild. Next up, we had the White Bean Soup. Simply put, this is a creamy soup made of Cannellini beans. While the recipe calls to use dry cannellini beans, I wanted to cut corners and instead used a can of beans. I wanted to save me the hassle of the overnight soak and cut down the cooking time. And I happy to tell you that my gamble paid off. Other variations to this recipe included adding a bit of fresh chopped rosemary when I was sauteeing the onions and garlic. And I did learn that the next time, I will need to use less liquid, since at the end of an hour, my beans were nice and tender, but my soup was still pretty liquid. I did make a slurry with corn start in order to help in the thickening the soup and it worked. But, at the end this soup was a total hit. The verdicts were pretty equal all around, we all love the silky texture and delicate taste of the soup. 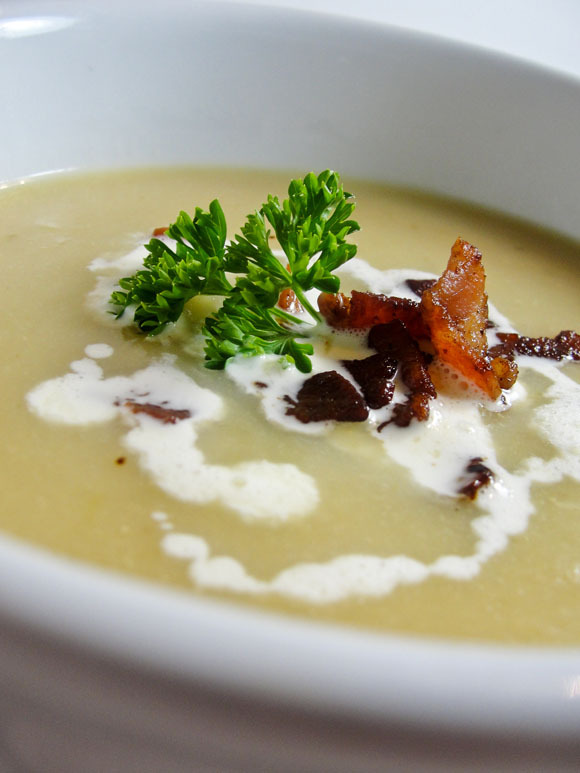 The crispy pancetta were a great touch and you could totally substitute this with croutons if you want to make this totally vegetarian soup. I used Italian soft fontina cheese to finish the toping but Parmesan cheese would totally work as well. Prepare ahead: The soup can be cooled, covered, and refrigerated for up to 2 days. Add stock to thin. Soak the beans in cold water to cover overnight. Drain. Heat 2 tbsp oil in a saucepan over medium-low heat. Add the onions and cook, stirring, for 8 minutes, until translucent. Add the garlic and cook for 1 minute. Add the drained beans, stock, celery, parsley, and bay leaf. Bring to a boil over high heat. Cover and simmer about 1½ hours, stirring, or until the beans are very tender. Stir in the lemon juice. Remove the bay leaf. In batches, with the lid ajar, purèe the soup in a blender. Return to the pan and season. Keep warm. Heat the remaining 1 tbsp oil in a small frying pan over medium heat. Add the pancetta (if using) and cook, stirring, 5 minutes, until browned. Stir in the shallots and cook 3 minutes, until softened. Trim off any rind from and dice the cheese. Stir into the soup. Ladle into bowls, and sprinkle with the pancetta mixture. Serve hot. The menu was simple, easy to put together in a couple of hours and perfect for a late lunch among friends. Make sure to check out the other Gutsy Cooks creations of this week Menu by visiting their blogs - here.